Personalized 10-Charm Bracelet With Crystals..
Personalized Canvas Prints - Inspiriting..
Personalized Blue Graduation Coffee Mugs -..
What should I give as graduation gifts? Well, my response to that has to more questions! Who is the lucky graduate? Are they graduating from kindergarten or college? Are they a boy or a girl? How much time do you have before you need to give the gift? I’ll break it down for you so that you can zero in on the best graduation gifts for your lucky grad. What kinds of gifts do you give as graduation gifts for friends? When friends graduate, it can mean that they’re going to move away for college, or a job, or to go back home. If they are leaving town then you’ll want to give them something to remember you, and the memories that you’ve made together, by. A photo related gift, or a book of reasons why you’re so glad that you’re friends, or a symbolic sculpture or candle will do the trick. You don’t have to spend a lot and you don’t have to give something big. This is when it is most important to come from the heart so that you two will keep in touch for the rest of your lives. What makes good graduation gifts for girls? If she’s graduating kindergarten, you’ll want to give her something that makes her feel grown up without getting something priceless. (She’s not old enough for real diamonds!) But, some pearl earrings or other piece of inspiring jewelry is a great way to go. If she’s graduating from high school or college it’s a nice idea to give her something that connects her with her roots like a pillow with the outline of her home state or a leatherbound copy of the newspaper from the day she was born. The other way to go is to give her something that inspires her to aim high and fiercely pursue her future. From “Oh the Places You’ll Go!” to a chance to drive a real race car, you want to choose a gift that will speak to her heart. What are the best graduation gifts for boys? If he’s of the younger set (kindergarten), then you should give him something that makes him feel like he’s on the path to growing up. Buy him a watch (not a designer one! ), or a gift that will help him learn a new skill before 1st grade kicks off in the fall. Also, depositing money in his college fund may seem uneventful to him at the time but will be hugely appreciated when the time comes to use it. If he’s graduating from higher education, honor his studies with a gift that sets him on the path to a successful career from an inspirational gift to something useful like a leather portfolio or garment bag for future business trips. Should you give personalized graduation gifts? Absolutely, yes! If there were ever a perfect time to give a personalized gift it is graduations (and weddings). There are so many amazing ways to go with personalized graduation gifts. You can get them a personalized team throw blanket with their graduation date and name on it. You can give them a personalized jewelry box or travel gear for keeping them organized as they take on their future. It could be as simple as a personalized travel mug for their commute (trust us, they’ll use it!). We love a personalized photo album, collage or print that guests at the graduation party can sign, too. No matter what they’re graduating from it will be fun to look back at as the years pass. Or, of course, you can go the fancy route and give engraved graduation gifts like a glass plaque, silver locket, or cocktail shaker to shake things up. How can I find last minute graduation gifts for him? If you’re short on time, but not short on guilt then you know you have to hustle to pull off an unforgettable graduation gift. We always tout experience gift certificates and of-the-month clubs as the perfect answers to last minute gifts because you can sign them up, print out the certificate, put it in a well-written card, and almost always get an ecstatic result. What guy wouldn’t want to drive a Lamborghini? How could he resist getting a new kind of artisanal ice cream in the mail every month? Give him something to enjoy immediately that’s related to the theme of the certificate you print out so that he gets some instant gratification. Or, plan a special date for the two of you to celebrate his accomplishment in his style. Tickets to a game? Lunch on a sailboat? Follow these tips and you’ll pull off a last minute graduation gift with panache! Graduation is more than a celebration of exams passed and glowing GPAs achieved - it marks the moment before grads enter the real world. High school grads are bound for college, and college and university grads are entering a new stage of adult life. Find a gift that says congratulations, sends encouragement and love, or helps prep your grad for what lies ahead. Consider graduation gift ideas that look beyond commencement. Give a leather portfolio to the just-out-of-college grad for encouragement to land that job. College students need to be powered up in two ways to function. Caffeine is one important source of alertness, so think of graduation gift ideas related to coffee. And then, of course, they need all their devices - phone, tablet, laptop - powered up and ready to use, so think charging devices and portable chargers. As a college student would say, "Send food, please." Graduation gift ideas that deliver food to their door are sure winners (think a pizza-of-the-month club). For grads craving a taste of home cooking, give kitchen tools that make cooking easier, like a 45-second omelet maker. Starting fresh on your own means you probably don't have an extensive set of tools if something goes wrong. Think about a practical graduation gift like a homeowner's tool kit or a personalized bag for the dreaded task of doing laundry. Show your grad how you're bursting with pride. Scout out a frame for the beloved diploma or a custom blanket in the college colors of their alma mater. From personalized jewelry to artwork for your grad's desk, look for graduation gift ideas that remind grads that they're loved. Graduation gifts for friends are gifts for the people who’ve been with you through it all at school. Whether we’re talking high school, college, or a master’s degree, your friends have been with you through every exhausting finals week, every hilarious homecoming, and every Friday night where there was nothing to do — but you still had fun. So here’s how to prep for graduation. 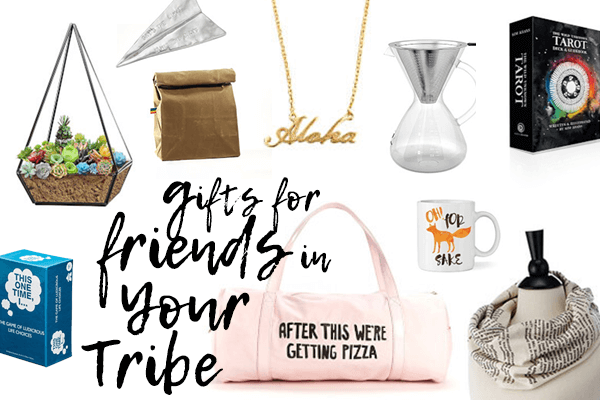 Study this gift list of ideas for the best graduation gifts for friends. You don’t have a huge budget to spend, but you do want to show your sweet boyfriend you’re big-time proud of him for graduating. And this is your hottie boyfriend, not your brother, so you want a graduation gift that shows him some heart-eyes love. 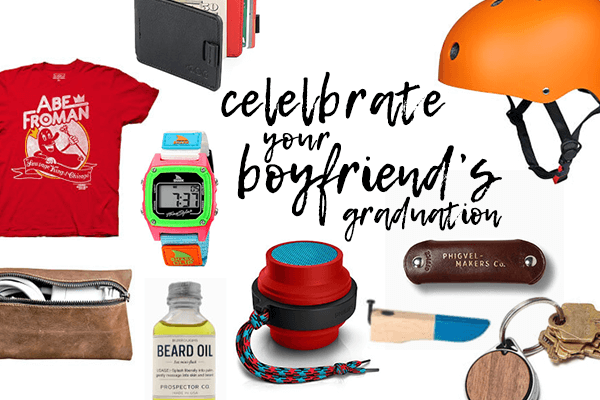 Look no further than this ultimate gift list of graduation gifts that makes searching gifts for the boyfriend something you can check off in a snap. Graduation gifts often get left to the last minute, and then you’re left thinking the only option is the money card (bor-ing). There’s another way to surprise grads who are soon to be dorm-dwellers or job seekers. What’s the secret? It’s by being the one person who gives a wrapped present for her to open. Even though your grad is all grown up, she still loves to be surprised. 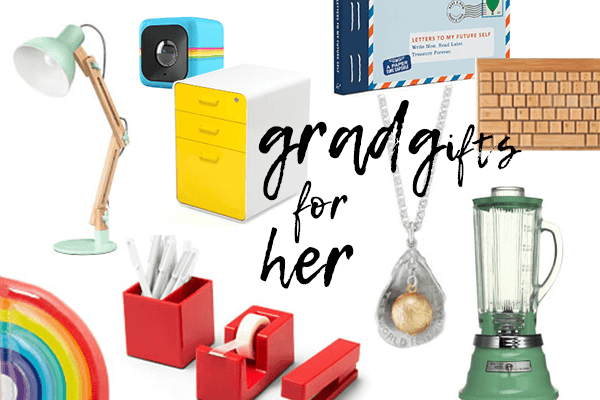 This gift list of graduation gifts for her helps you do just that. 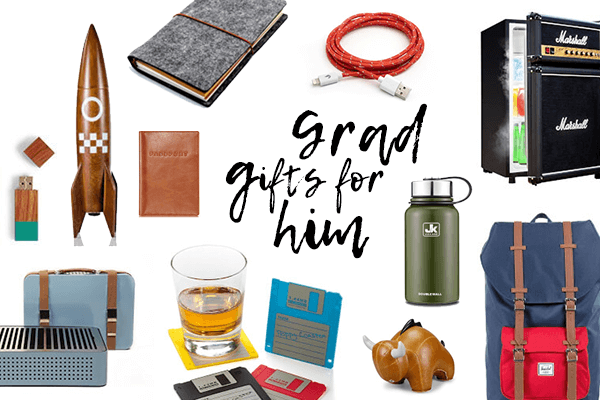 Graduation Gifts For Him, Because He Did It! Every grad deserves a gift that celebrates the big accomplishment of finishing school. To score a graduation gift that’s just right for your grad, you want to consider a few things. What school level is he graduating from? What’s next after graduation? What’s he like? Here’s a gift list that’s the solution to your questions. You’ll be sending him off with a graduation gift that celebrates this big moment, or sets him up for success in the next chapter.